Horizontal and vertical cartoners are primarily designed for packing various individual or multiple products into cartons of various sizes and shapes. 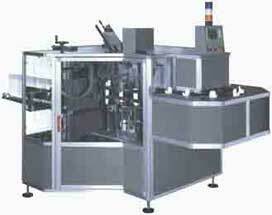 The AST 60 is a automatic vertical cartoning machine. Final result: - Cardboard box completely closed with tucked flaps. 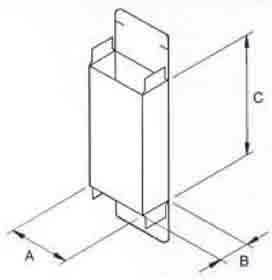 Version:- Left hand ( the product flows from right to left seen from the front of the machine). Frame:- Heavy duty stainless steel welded frame. Machine designed for 3 shifts operation. Motion:- Intermittent motion with all movements mechanical driven not with pneumatic actuators. Bucket infeed conveyor:- Indexing motion from an enclosed intermittent cam unit. 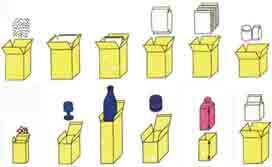 Carton magazine unit:- Blank extraction by suction cups. Carton conveyor:- Heavy-duty conveyor with four chains. Carton size adjustability:- Set-up hand-wheel controls with readout. Carton flap closing:- All flaps are closed by fingers cam driven. Side belt:- Flap compression after gluing by two belts and used also to horizontal discharge. Transmissions:- Driving made with timing belts HTD type. Overload clutch for safety operation. Hand-wheel drive for manual setting. Lubrication:- Machine without lubrication necessity of daily lubrication. Adjustments:- All adjustments set with hand wheels and mechanical digital readout. Quick release handles. Guards:- Guards all around machine. Drive:- Internal line shaft drives. Automatic feeding arm. It picks up the products from a conveyor and inserts inside the package. This cartoner is offering wide capability of carton sizes and can handle variety of products. AST 60 automatic vertical cartoning machine.